Dying young is a surefire way of stoking the flames of legend. So it should come as no surprise that the two most visited graves in Paris’s Père Lachaise cemetery are those of Fryderyk Chopin and Doors wild man Jim Morrison. It seems reasonable to surmise that had Lech Wałęsa been removed by the secret police back in 1981, he would now be soaring amongst the officially beatified saints. In Chopin’s case, chroniclers were quick to jet off on their flights of fancy. As in Vasari’s entertaining tales of Michelangelo and co, Chopin’s legacy is peppered with accounts of him playing polonaises in his nappies, and other such anecdotes. His legend seems irresistible. As Zamoyski writes, “film-makers have dripped blood on the keyboard and politicians have attempted to claim him, for France, for Poland, for Slavdom, and even for Poland’s Jewish community”. 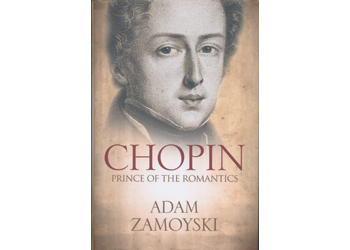 This study of Chopin, a revised and extended version of a book written in 1979, is an attempt to “cut through the myth”, in the author’s own words. Alongside his background as a historian and his family’s close connections with the composer, Zamoyski’s mastery of Polish, French and English makes him ideally placed for the job. And whilst this book may disappoint readers in search of a gushing romance in the style of Chopin’s notorious lover George Sand, it’s a perfect point of departure for getting to know the man, as opposed to the myth. Chopin was clearly a beguiling and witty guest when not indisposed, and it’s hardly surprising that this dapper, handsome pianist sent hearts fluttering whilst at the keyboard. He was a great mimic and joker throughout his life – one contemporary quipped that Chopin had missed his true calling as an actor. But there’s no halo for the man in Zamoyski’s account. Prone to tantrums, and demanding with those hard-up friends who ended up in his service, he could be a decidedly prickly fellow. Yet in spite of his constant ailments, he always managed to pull himself together when the moment came to perform. Zamoyski was praised for his vivid accounts of war-torn drama in his book 1812, but here the tone is consciously low key. Evocations of the Polish Uprising of 1830 – which divided Chopin from his family – are left to the imagination. Likewise, there is no description of the eruption of violence in Paris in 1848. Zamoyski stays rigidly on his subject, offering an intimate, warts and all portrait. The writing is always elegant and assured, with the original sources woven in with a light touch. All in all a sober and insightful complement to the sweeping romance of the music itself. This is exactly what this book does to you. It keeps you involved from the first page to the last one. You watch the little Fryderyk grow, when he is just a kid, in whom adults put their trust and hopes. His life engages you as if it was your own. The special atmosphere of the Polish emigrant society, the scent of Chopin’s favourite violets accompany you until the moment, when your heart is touched by the scene of his death. When his life ends, you are violently brought back to the colourless reality. An excellent book, a deep and true story of an exceptional man, without the myth that aroused around him. So, if you want to keep your life to yourself, do not read it. But you will lose the only chance to meet Fryderyk Chopin, the prince of the Romantics.